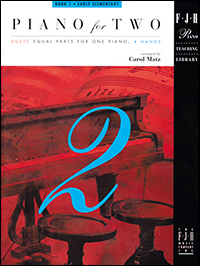 This series provides a wonderful opportunity for students to work on aspects of ensemble playing, such as dynamic balance and tempo control, while learning some of their favorite well-known pieces. These well-crafted, pedagogical arrangements use simple eighth-note rhythms, avoiding dotted-quarter and more sophisticated rhythms. 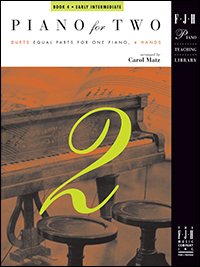 The arrangements in this book incorporate the use of eighth-note and dotted-quarter note rhythms. 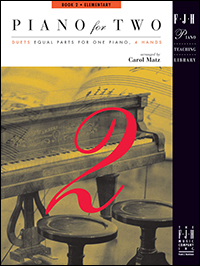 Circled finger numbers signal change of hand position and the pedal markings are indicated in the secondo part. 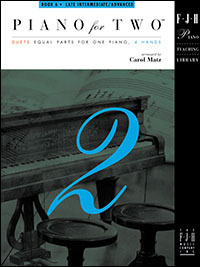 Outstanding arrangements written especially for intermediate pianists. This enjoyable collection is sure to be a hit with both students and teachers! 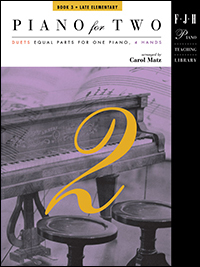 Arranged especially for late intermediate / advanced pianists, this exceptional collection features a wide range of pianistic styles.